I'm often drawn to slightly macabre, creepy old trinkets and treasures - a quick look at my ever-growing Inside the Imagination Pinterest board will tell you that much. So when I came across the work of Jennie Sharman-Cox on Etsy, it was love at first sight! Since then, Jennie and I have been in contact and I am delighted to be able to share more about her wonderful work with you . . . Curiosity Boxes . . .
Jennie has worked with textiles for many years, from making theatrical costumes to designing beautifully detailed Edwardian-style teddy bears. A collector by nature, she has always had a passion for anything old and interesting. She comments: "Most recently my love of vintage fabric and antique paraphernalia has led to two new areas of work, my bespoke jewellery collection and my boxes of curiosity." "I started making boxes in 2011 as I explored the idea of confinement and restriction through the assemblage of found objects. 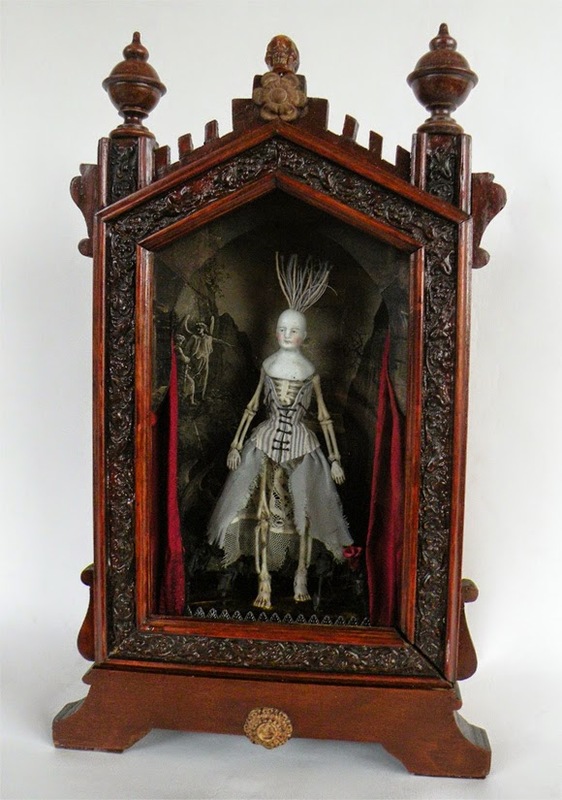 By delving into our curious fascination with death, religion and the macabre, via gothic Victoriana, taxidermy, with a bit of theatre thrown in, I found that one object led to another and stories began to emerge. 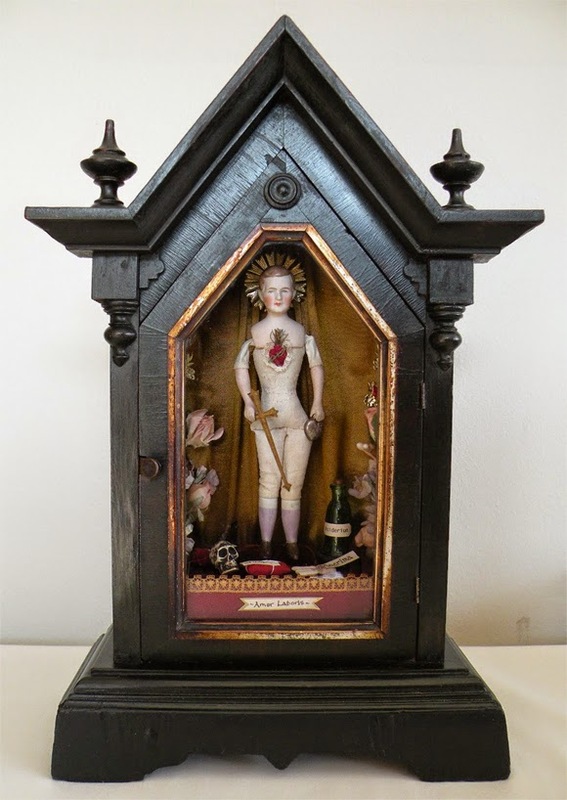 In our secular age we are still searching for the meaning of life and death, so setting my work within a shrine-like box, I am able to use religious iconography to explore and present my thoughts." 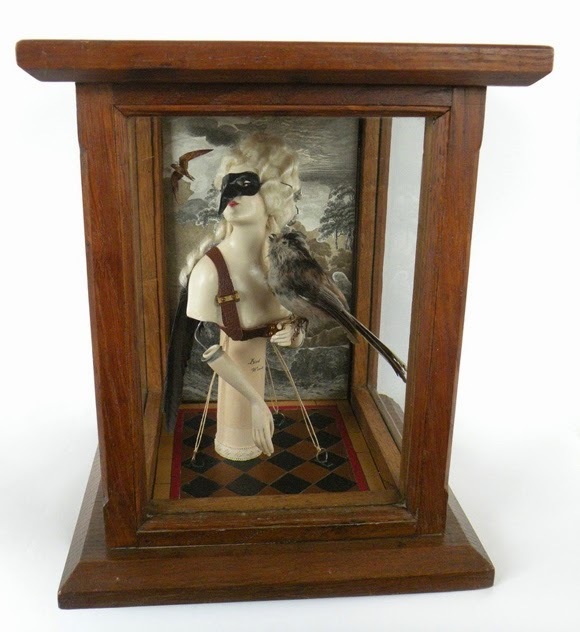 "I use mainly antique and vintage found objects, fabrics etc - many of which I have gathered together over the years, although I construct the interiors of the boxes and make anything else required from clay, wood, card or fabric. The detail is very important to me." "Part of the fun for me is to rummage and find things in all sorts of places, I trawl antique markets, junk shops, even old sheds for just that right little bit, if something speaks to me I tuck it away, everything finds its place in the end." 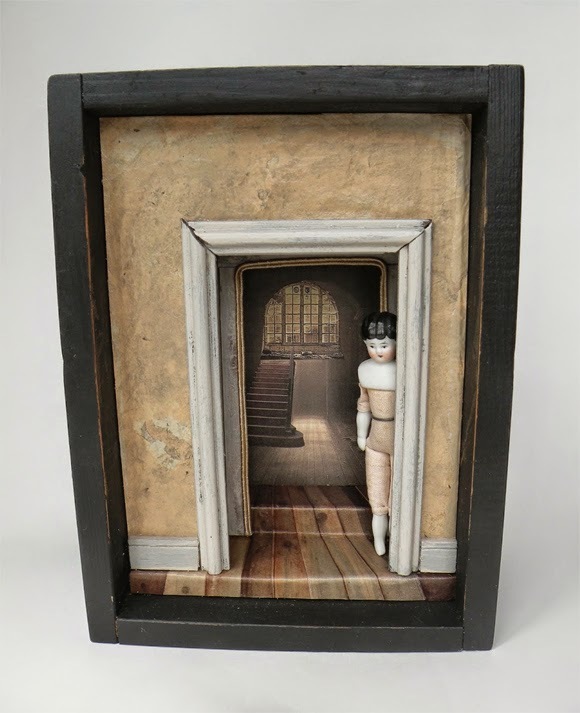 Jennie's sense of theatre and the macabre is certainly evident in these amazing art boxes! It was Doorway that first grabbed my attention (the first image of this post) - a doll, stripped of its clothing, peering (nervously or menacingly?) around a doorway in a seemingly derelict house - there are so many avenues the imagination can go down from that scenario! 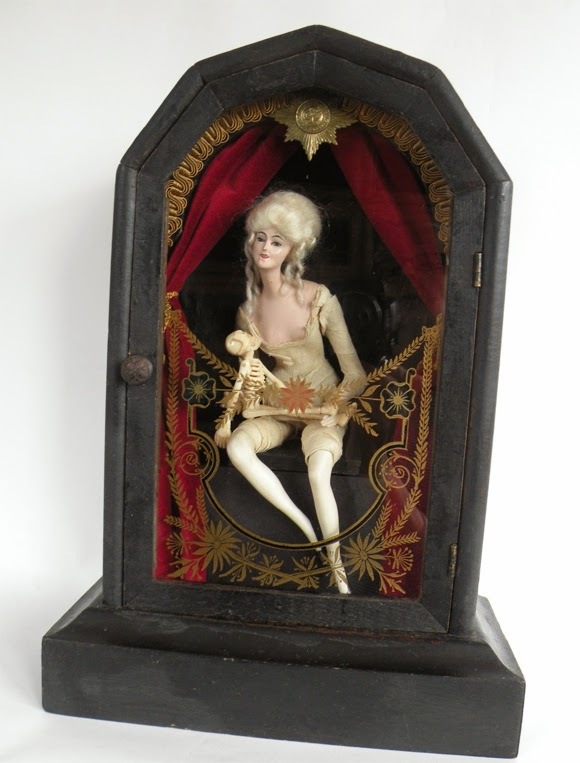 Sitting perfectly at ease next to Jennie's creepy curiosity boxes are her stunning jewellery creations. Jennie's first jewellery collection launched in 2010 and, as testament to her immense talent, early pieces were chosen for the 'Bling' exhibition at the V&A Museum of Childhood in Bethnal Green. 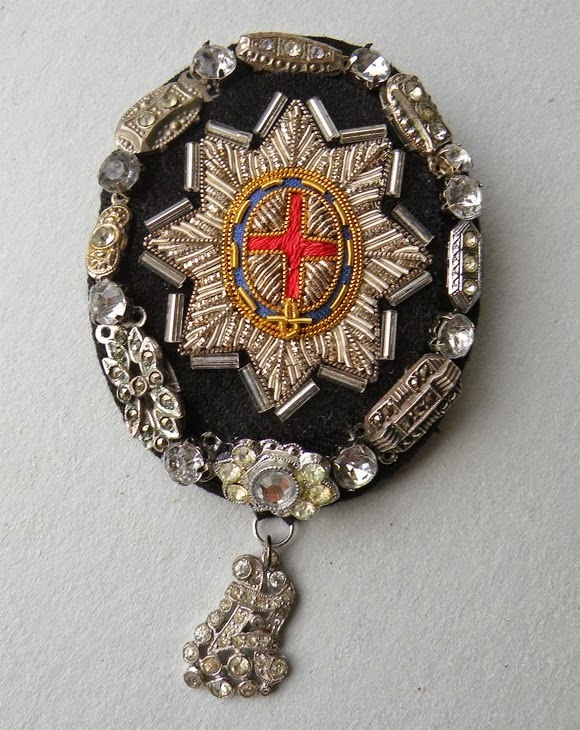 To me Jennie's jewellery evokes the grim fascination Victorians had with mourning jewellery, which often involved working a lock of a dead loved one's hair into a brooch or pendant. 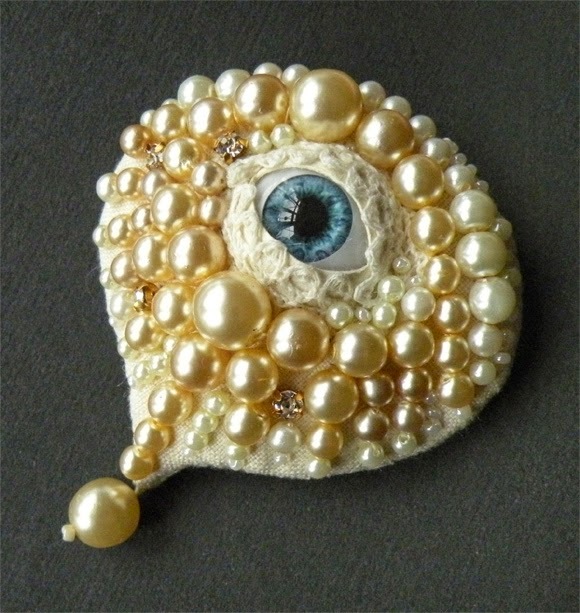 In Jennie's work, glass eyes are nestled into beds of beautiful pearls and diamantes and again, open up so many avenues for the imagination. 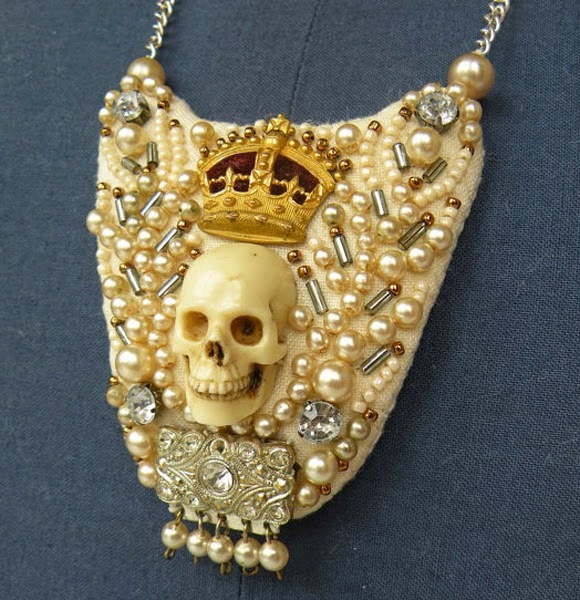 Military elements also feature in Jennie's jewellery design, often alongside skulls and skeletons . . .
Jennie says: "Having worked with textiles for so long it seemed quite natural when I began to make jewellery, that it should be fabric based and hand stitched. I was itching to incorporate some of my antique military badges, braid and metal insignia along with a few skulls and eyes, into wearable pieces so I started experimenting." 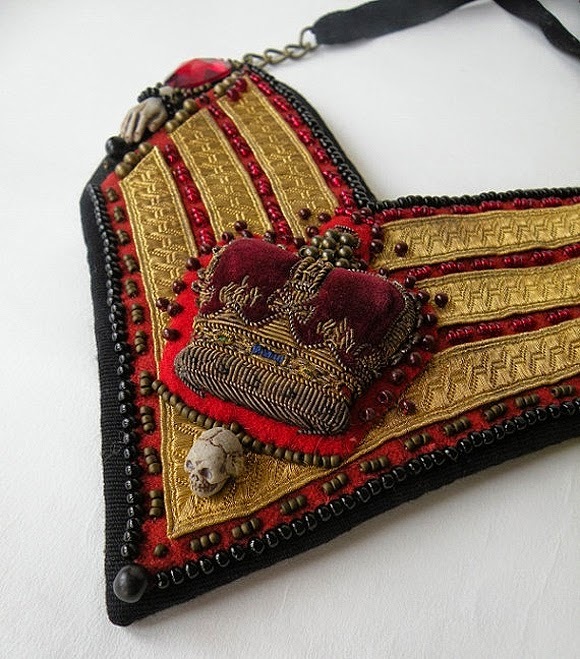 "I like to use antique and vintage components as much as possible, old linens and grosgrain, layered with lace, vintage faux gems and pearls, seed beads, military regalia, glass eyes and skulls. My life long passion for collecting old and interesting things has been inspirational in my work and the detail is all important to me. Each piece is entirely hand stitched and takes many hours of work, but I love to sew!" If, like me, you love intricately detailed jewellery and trinkets with a twist - that can truly ignite the imagination - then please make sure you check out more of Jennie's work via the links below . . .
More Jennie . . .
Oh my gosh I am in love! Creepy, creepy love!